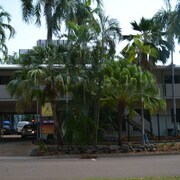 Located in Darwin City Centre, this motel is within 1 mi (2 km) of Crocosaurus Cove and Darwin Waterfront. Cullen Bay Marina is 1.6 mi (2.6 km) away. Charles Darwin did a lot with his life—like figuring out that whole evolution thing and whatnot. And because of his accomplishments, he got a lot of things named after him: schools, parks, buildings and a city in the Northern Territory, for starters. Excuse us, the capital of the Northern Territory. And what a delightful place it is. The soothing coastal waters offer a great escape after you’ve hiked around the national parks of Kakadu and Litchfield. And after all that, our great Darwin hotels are the best places to lay your head down at night. How do I get to Darwin from the airport? Your flight will land at Darwin International Airport (DRW), 13km from the city centre. 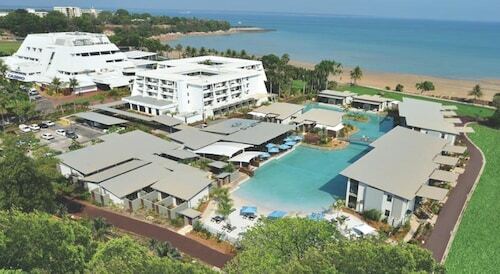 You can take a taxi, shuttle or book car hire to reach any of the hotels in Darwin. What kinds of hotels are there in Darwin? There are all sorts of places to stay in Darwin. Seriously, there are boutique hotels, luxury resorts with more stars than the universe and even places that look like your apartment back home. Here’s a short list of some of our favourites. Vibe Hotel Darwin Waterfront: The name doesn’t lie; this place really is on the waterfront. There are rooms with epic ocean views, an on-site restaurant with great food and drinks and a spa that will relax you beyond your wildest dreams. One30 Esplanade: If you’re looking for a place that feels just like home—but with maybe a little more pizzazz—this is the spot for you. This fully serviced apartment hotel has rooms ranging from studios to three bedrooms and an array of amenities. What sort of amenities, you ask? A 25-lap pool, fully equipped gym and maid service. And that’s just three of them! You’ll have to stay here to find out the others. 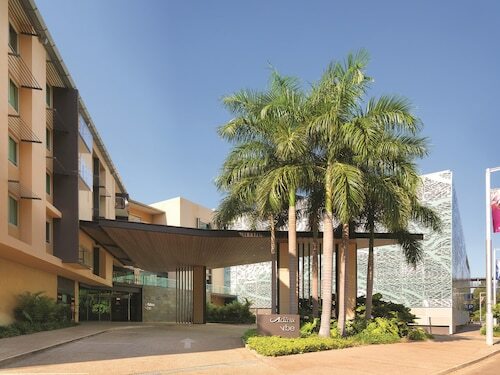 Palms City Resort: If you’re looking for accommodation in Darwin that’s on the Esplanade and has luxury villas, look no further than Palms City. You can get yourself a standard hotel room, but where’s the fun in that? Since you’re on holiday, you might as well spring for the executive villa with a private outdoor spa. Yes, please! 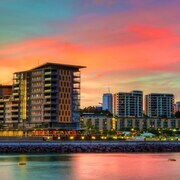 Where should I stay in Darwin? The capital city of the Northern Territory is full of quaint little neighbourhoods. Larrakeyah’s parks are great for picnics. Stuart Park has an unbelievable fish and chips joint. The Marina is home to whale watching tours and the downtown area has epic nightlife. And in those neighbourhoods, you’ll find plenty of Wotif’s Darwin accommodation options. Don’t believe us? Follow along below. What are some things to do in Darwin? From trekking through the rainforest to swimming in the ocean and wandering through museums, there’s no shortage of activities to keep you busy during your stay. Berry Springs Nature Park: Fill up a picnic basket with your favourite treats and enjoy a delicious meal in a picturesque park. When you’ve eaten, go for an easy hike through the monsoon forest. After you’ve worked up a sweat during your nature walk, take a dip in the swimming hole. Now, is that a fun afternoon or what? Crocodylus Park: You can’t go on holiday without visiting some sort of wild animal park. That’s why you’re going to pay a visit to Crocodylus Park. Not only will you get to see a keeper feed giant saltwater crocodiles, but you’ll be able to have a real animal encounter. What’s better than cuddling with koalas and baby kangaroos? The answer is nothing. World War II Oil Storage Tunnels: No, this is not a joke. These tunnels exist and you’d be a fool not to explore them. They were built to protect the city’s oil from Japanese bombing raids, but now they’re open for your enjoyment. Hey, we’ve done our part, so now it’s time for you to do yours. All that means is booking one of Wotif’s Darwin holiday packages, leaving immediately and staying as long as you want. And if you get the urge to visit the land of kiwis, our deals on Auckland accommodation are unbeatable. Book one, hop on an airplane and eight hours later you’ll be in New Zealand’s capital. How Much is a Hotel Room in Darwin? Hotels in Darwin start at AU$64 per night. Prices and availability subject to change. Additional terms may apply.